Nothing is more fun than making the cake for a single-digit birthday party. You have the excuse (the encouragement, really) to go crazy with frosting, food coloring, candy, marshmallows, and Oreo products. It doesn’t happen too often for me, but when it does I take full advantage of it. I was delighted to spend a recent Saturday shopping and having lunch with my mom, followed by some serious cupcake decorating. 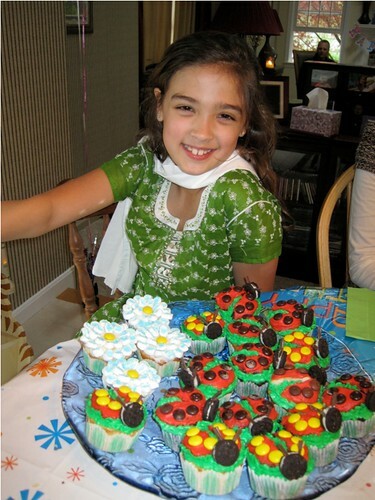 Our theme was ladybug and flower cupcakes for our friend Neha’s daughter Nicole. Mom was an excellent assistant. 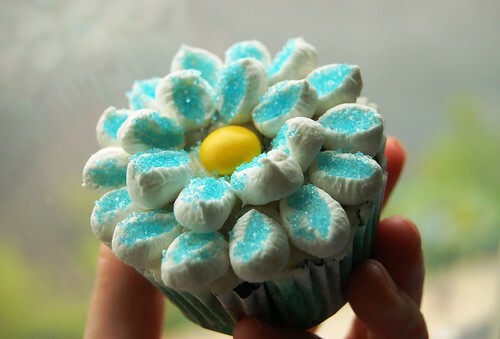 I assigned her the job of making the flower cupcakes, which involved cutting dozens of mini-marshmallows in half and dipping the sticky ends in colored sugar. It was a little payback for the hundreds of potatoes I have peeled for her over the years on Thanksgiving morning. I think the beautiful newly-nine-year-old birthday girl liked them, too! 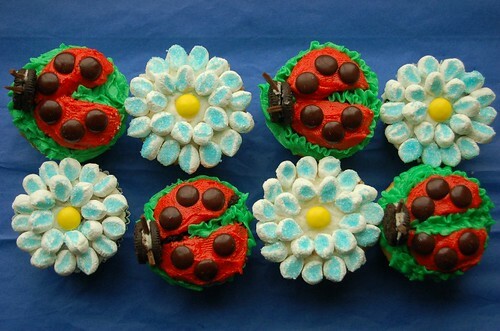 If you make a batch of 24 cupcakes I would suggest doing 12 ladybugs and 12 flowers. In a large bowl, combine sugar, butter, vanilla, and 1/4 cup of milk. Mix on low-speed until combined and smooth. Add more milk if needed, but you want the frosting to be somewhat stiff so it will stay in place. Separate frosting into 3 bowls. Leave one white, tint one green, and one red. For the deepest color, use gel-based food coloring. Pipe green-tinted frosting onto the cupcakes to look like grass. Separate the cakesters and discard the “creme filling”. Cut cakester halves down the center to make the ladybug wings. Spread red-tinted frosting on cakester wings and place on top of green grass frosting at a slight angle to each other. Press 3 dark brown M&M’s onto each wing for ladybug spots. Using a sharp knife, cut chocolate Twizzlers into 2 cm long antennae pieces. Cut pieces into slender strips. Twist mini Oreo apart and place a small dab of white frosting onto the Oreo creme filling. Press chocolate Twizzler antennae into the frosting and lightly press the Oreo back together. 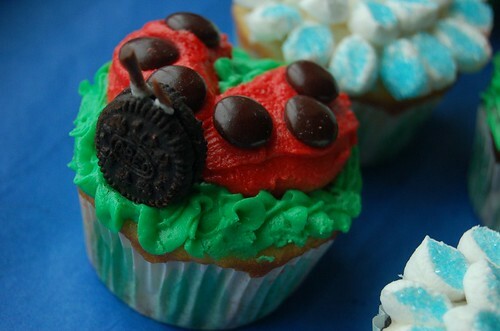 Press mini Oreo into green grass frosting in front of the wings to complete the ladybug. Fill in any “gaps” with more green grass frosting. Spread a thin layer of white buttercream onto the cupcakes. Pour colored decorating sugar into a small bowl. Using kitchen shears or a sharp knife, cut the mini-marshmallows in half and dip the sticky cut surface into the colored sugar. Press the mini-marshmallow into the frosting along the outer rim of the cupcake, colored side up. Repeat process, arranging the marshmallows in a circle, then repeating the circles towards the center of the cupcake. Place a colored M&M or gumdrop into the center of the flower. These are absolutely beautiful! For a single digit or a higher double digit-amazing!! Perhaps you will get your own garden next month, Fiona! Haha! How cute are these?! I’m going to try to make them with my grandkids. These are so cute! What a super treat for the birthday girl. A treat for you and your mom too to have such a fun project to share. Hands down, the cutest cupcakes I’ve ever seen. the flower cupcakes will be perfect for my office warming party (yes i am hosting an “open office” for my new office to make up for the fact that i no longer have a window). 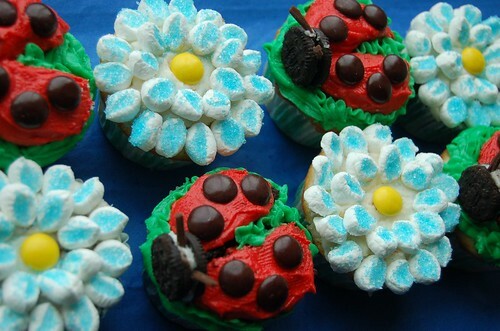 these cupcakes are better than sunshine! The cupcakes are killing me with cuteness, gahhhh!!!! Super cute!! I love the flowers! These were special because they were made with love! Thank you so much! And boy were they delicious.